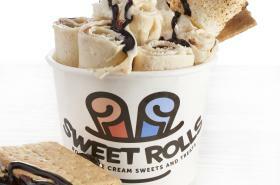 Sweet Rolls brings a sensational experience to Pensacola in the form of rolled ice cream. Right before your eyes we create a magical treat in a variety of flavors, with many of them inspired by New Orleans, such as the Gentilly, Pralines and Cream, Bananas Foster and more. We start with the liquid ice cream, and mix in the ingredients to bring the flavor to the ice cream as it slowly freezes into ice cream on a pan that is below 0 degrees Fahrenheit. Next we scrape the mixture off the pan into beautiful rolls and place them into the cup, before adding our house-made whip cream and other toppings. It is a taste of heaven! Additionally, we offer a variety of more traditional sweets in the form of gelato, cupcakes, churros, cinnamon rolls, cannolis, and macarons. Your visit will not be complete without having a glass bottle of Coca-cola from Mexico along with it. We also have Fanta, Barq's Root Beer and Sprite in glass bottles, as well as Stok's Cold Brew Coffees.